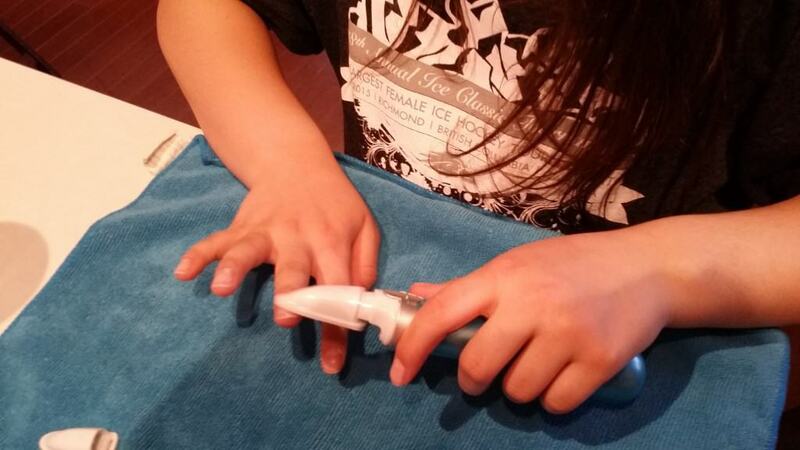 The Amopé Electronic Nail Care System is very easy to use. It is a 3 step system that takes minutes to make your nails look beautiful. I was surprised at the difference I could see after the first use. The Amopé Electronic Nail Care System is easy and fun to use. I absolutely love it and highly recommend checking it out. The three separate heads are easy to use and click into the pen unit. The heads are replaceable also when you wear them out. Amopé Pedi Perfect Electronic Nail Care System comes with an electric nail file with 3 different heads for filing, buffing and shining for both toe and fingernails. It works with 1 AA battery (included). The Amopé Electronic Nail Care System is awesome for your fingers and toes 🙂 to make all your nails beautiful in a snap. Amopé™ Pedi Perfect™ Electronic Foot File with Diamond Crystals is the Whats new product. Amopé™ Pedi Perfect™ Electronic Foot File with Diamond Crystals™!